We use UPS, Fedex and USPS for U.S. orders and have now partnered up with GlobalShopex for international order processing. FREE SHIPPING OFFER IS FOR SHIPPING IN THE CONTINENTAL U.S. ONLY. Orders are processed as they come in and shipped within 48 hours or less, not including weekends and holidays. If something is not available and/or cannot be drop shipped, the customer is notified via email or phone. If you are a customer in Florida, you will usually receive your order within 24-48 hours of shipping so there is no need to choose Next Day, 2nd Day nor 3 Day Select. Please note that the cutoff time for same day shipping is 2:30pm EST. Any orders that come in after this time will be processed the next business day regardless of the shipping option chosen. Orders in which the shipping address is different from the credit card billing address, will require extra verification. This may delay shipping by one or two days. Please note that for security reasons, all orders over $99.00 will require signature verification for delivery. Please take this into consideration when placing your orders. To make sure your order goes out on time, please make sure your credit card billing address is entered correctly. Any order with a mismatch on the billing address is flagged and taken out of processing until the customer is contacted and address is verified. This can take several days if the customer is not available or does not respond right away. If we do not get a response from a customer within 10 days, we cancel the order and issue a refund. UPS/Fedex/USPS shipping times depend on the service requested and the state where item(s) are shipping to. Please note that the day of shipping as well as weekends and holidays, do not count as one of the days in transit. We do not offer Saturday delivery due to the high cost. Any order requesting Next Day shipping which is placed on a Friday, will be delivered on Monday. Any order requesting Next Day shipping placed before a Holiday will be delivered the next business day after the Holiday. Please see the ESTIMATED transit times for UPS and Fedex Ground shipping on the maps below. Please note that transit times for Ground services for UPS, FedEx and USPS First Class Mail are NOT guaranteed. USPS First Class Service(standard shipping) has a transit time of 1-10 days depending on the destination. USPS Priority Shipping has a transit time of 1-5 days depending on the destination. If you need something delivered by a specific date, we highly recommend you use a next day, second day or third day services. While we strive to get your orders to you as fast as possible, please understand that once we hand the orders to the freight carriers, we cannot control the speed of delivery. 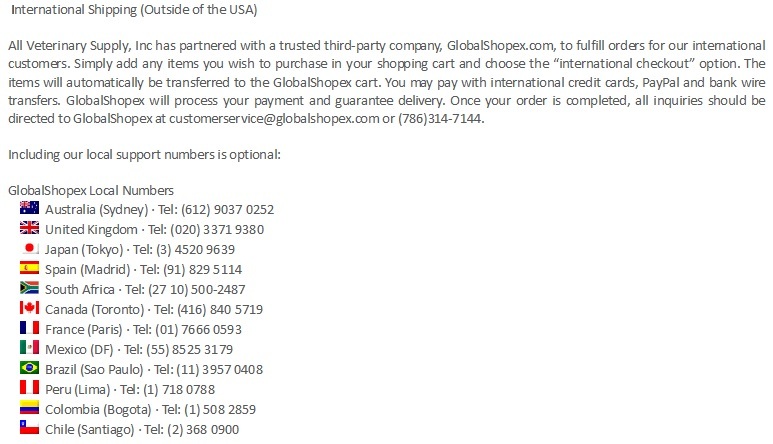 Please note that you do not have to use Globalshopex for shipping internationally, we offer several international options at the check out. To see other checkout options, simply click on "Secure Checkout Now" instead of "International Checkout". We offer our international customers the Globalshopex option in order to help facilitate payment and shipping as they are experts in shipping to various countries. Also note that depending on country specific regulations, we may not be able to ship the item you want to your country. If this is the case, we will notify you right away. Customer is responsible for paying all local import taxes and/or local brokerage fees in their respective countries. We accept all major credit cards as well as Paypal, wire transfers, cashier's checks and money orders. In order to pay with anything other than credit cards and paypal, please call our customer service number at 877-425-5838 and speak to a customer service rep.
Due to many recent fraudulent order attempts, any order that is shipping to an address other than the actual billing address of the credit card being used, will be flagged for verification. This will consist of phone and id verification. The verification process may delay shipping for an extra 24-48 hours. If you would like your order shipped as soon as possible, we highly recommend shipping to the same address as the credit card. 30 day Money back Guarantee and Return policy on all unused products(certain restrictions and exclusions apply). ALSO, THERE ARE NO RETURNS ON SPECIAL ORDER ITEMS, PRESCRIPTION DRUGS, PRODUCTS REQUIRING REFRIGERATION AS WELL AS ELECTRONIC EQUIPMENT SUCH AS ELECTROJACS, ULTRASOUNDS, CATTLE WEIGHING SYSTEMS, NEBULIZERS, MICROSCOPES AND X-RAY UNITS. Please note that the customer is responsible for all taxes and duties on all international orders. Customers are also responsible for making sure the ordered product(s) is allowed into their respective countries. If a product is returned due customs issues, the customer will be responsible for any return freight incurred.